The Warner family of Chipping Campden in Gloucestershire were clockmakers over several generations until at least the 1880s. In his book 'Gloucestershire Clocks and Clockmakers' the late Graham Dowler sets out a pedigree of four generations with some certainty, before which things were a little hazy. I knew Graham Dowler and lent him a few photographs for his book, which was published in 1984. The book includes a rare lacquer longcase clock of about 1685 by William Holloway of Stroud. I remember his telling me of his disappointment that Cheltenham Museum, who owned the clock, were asking an unrealistic fee to supply him with photographs - as if it was not hard enough to fund a regional book with a small sales potential. It happened that I had sold the clock to the museum some years earlier, so I lent him photographs I had taken of it when it belonged to me - free of charge. I sometimes despair of the attitude of custodians of our history. Sadly Graham died in 1989 but his book lives on and I refer to it constantly as I am sure many others do. Regarding the clockmaking Warners I have been able to add two earlier generations from my own researches - six generations of clockmakers in all is quite a span. The Warner genealogy of the seventeenth century in this region is very complicated, as they were numerous and the records incomplete. One branch of the family went to America at this time and some of the enthusiastic research carried out by American descendants into their English origins can be less than reliable. John Warner, the earliest member of the family we know to have made clocks, seems to have been born in March 1647, the son of William Warner by his wife, Mary George, whom he had married in 1642. John was the eldest surviving son, who traditionally would have followed the trade of his father. So William may have been a blacksmith. Professions are rarely mentioned in parish registers of this period. William lived at Draycott, a hamlet within the parish of Blockley, which was the next door parish to Chipping Campden, in Gloucestershire, but was actually across the county boundary in the county of Worcestershire. Draycott was only a couple of miles from Chipping Campden, but had no church of its own and, if you lived there, you had to use the church at Blockley. Warners lived in both parishes. Those living in Chipping Campden used that church; those living in Draycott used Blockley church. If William of Draycott made clocks, then no example has yet been recorded by him. But at this early period those rural craftsmen who made clocks or mended them were usually blacksmiths since clockmaking as a full-time profession barely existed yet in rural England. As it happens there was another John Warner born in 1649, the son of a different William Warner, by his wife, Anne Dide, and this John emigrated about 1675 with his parents to Philadelphia., where he died in 1717. The life of John Warner, the clockmaker, has proved difficult to document, for the usual reason we have problems in revealing the lives of ordinary people at this time, namely that they seldom appear in records, apart from those of baptism, marriage and burial. He attended church in, and in fact I believe he lived in, the parish of Chipping Campden, where his children were baptised: Alice on the 5th December 1668 and Mary on the 26th December 1669. His wife's name is unrecorded, and his marriage as yet untraced. Alice may have been named after his younger sister, Alice, who was only eleven at the time and died tragically young in 1673 aged only sixteen. Mary may have been named after his mother. These are only suppositions but at this period children were normally given names for a reason, usually named after family members and certainly not names picked out of a hat. A document exists dated 1669 whereby John Warner of Westington in the parish of Chipping Campden assigns to John Goodwyn of Chipping Campden a lease to some property he held from Lord Noel Viscount Campden, namely a house and lands and "five bays of the long barn". So we assume John was in Chipping Campden in 1668 and 1669. The clocks illustrated here were signed by him without any placename, as are two other examples documented in my records. We can identify him as there are several indications that this is a West Country clock and we know there were no other provincial clockmakers named John Warner living at this time (though proof of the location of this particular John Warner was to emerge unexpectedly later). Signing without a placename was normal for a clockmaker living in a small country location. There are several reasons for this. One is that the names of villages and small towns might be unrecognised twenty miles away. Another is that the clockmaker may have tried to sell his clocks at markets in several nearby towns, including some where he was forbidden to trade by local by-laws, and therefore he did not want to pin himself down to any one location. Moreover local loyalty might put off a potential buyer in town A from buying a clock signed as made in town B. Far better for him to sign by name only. As it happens there were so few rural clockmakers in the late seventeenth century that a clockmaker such as John Warner would be well known for his work on church clocks and house clocks for many miles around. We were to discover that the clock pictured here carried the hidden date of making - 1692. Two years later, in 1695, John Warner made the church clock at Chipping Campden and dated it. Moreover a note exists in the churchwardens' accounts "Paid John Warner for making a new clock and mending the chymes" £08.10s.0d. (presumably chimes of the previous clock). The previous clock had proved inadequate and a note quoted by Graham Dowler from 1662 "for mending the clock to make it heard abroad £00. 00s. 08d". This probably means that its strike had lost volume and presumably only a small adjustment was needed to correct that, hence the small charge of eight pence. At that time (1662) John Warner was only fifteen. Was the clock repaired by his father William? The records do not say. John Warner built the new church clock at Chipping Campden in 1695. But the clock also had a carillon of bells perhaps something outside his experience. Clocks magazine for November 1983 carries an article on the overhaul by John Smith & Sons of Derby of this clock and much later carillon. There it is stated that the original carillon was installed in 1692 (the very year John Warner was working on this lantern clock pictured here) by Thomas Ballard, was replaced in 1718 by Sleight of Pershore and was further replaced in 1816 by Richard Hulls, a builder of Chipping Campden. I don't know who Thomas Ballard was but a man of this name had children baptised at Chipping Campden between 1685 and 1692, so perhaps he too was a local builder. It seems the two trades were quite separate. In 1692 Thomas Ballard could fit the carillon but could not make a new clock and in 1695 the opposite applied to John Warner, and in 1718 to his successor. In December 1696 John's unmarried daughter, Alice, gave birth to an illegitimate daughter, she named Alice after herself. She was twenty eight years old. Then in 1697 a daughter named Abigail was baptised at Chipping Campden to a John Warner. If we assume this is still John Warner the clockmaker, and we know of no other there, then he was fifty years old. About the year 1700 John Warner I, the clockmaker, appears to have had a son named John, though his baptism has not been traced. 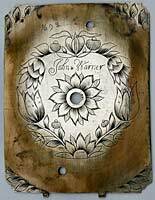 This John, born in 1700, was John Warner II, the second clockmaker in the family. John Warner II lived at Draycott. He was married in 1721 to Mary Dyde, by whom he had five children, including John Warner III, born in 1733, who was to continue the clockmaking line. In 1733 John Warner was paid for two years' upkeep of the Blockley church clock and in 1738 for one year. This could only have been John Warner II, then aged about thirty three and thirty eight respectively. John Warner I is believed to have been long dead by then, and if not he would have been eighty six years old and hardly likely to be climbing clock towers. One record suggests that John Warner (I) died in 1727, when he would have been eighty years old. This is quite reasonable but I don't know how reliable that date is, as I have not been able to confirm it. I have kept records of such things for many years and so far I have recorded only three domestic clocks by the first John Warner, all lantern clocks. The first is one I recorded many years ago, I forget the source now, but it was signed simply 'John Warner', was believed to date about 1680 and was converted to anchor escapement from verge pendulum. The second is signed 'John Warner Fecit' and was converted to a two-handed spring-driven movement many years ago. The third is signed 'John Warner', has its original verge escapement, and appears by its style to date from about 1690. In fact it is dated 1692 on that part of the dial sheet hidden by the chapter ring. It is always a pleasant surprise to find a year of making on a clock as it was not a practice that was widespread. A few early clockmakers from the West Country dated some of their lantern clocks visibly on the dial - John Snow of Salisbury was one, Edward Webb of Church Stoke another. The practice of dating a clock behind the chapter ring in this way whereby it is hidden from view seems to have been popular with a number of lantern clock makers from this part of the West Country. Clockmakers who did this on their lantern clocks include Thomas Veale of Chew Magna and Edward Webb of Flax Bourton. So John Warner was following the trend he had seen on local lantern clocks. There are a few interesting touches to this lantern clock. The top plate is marked out with scratch lines for his layout, indicative of the maker's own handiwork. His crossbars fix at the top by a slot sliding over a specially-fitted brass lug, then further braced by two pins, a much sturdier system than the usual held-by-a-wedge method. This method has been recorded occasionally on other lantern clocks in the area - oddly enough on clocks dating from 1672 and 1682 (and now on this one of 1692), but it is very unusual. The clock never had a rear hanging hoop or wall spurs, indicating that is must have been intended to sit on a shelf. This latter feature has been observed on quite a number of other West Country lantern clocks, suggesting that it was an occasional regional feature. No sooner had I written this than by one of those chance events that seem to happen in horological research a fourth lantern clock came to light. I stumbled across the website of Barry Carter, a clock and watch restorer in Victoria, British Columbia, Canada, who just happened to have a lantern clock by John Warner in his workshop for restoration. I contacted Barry, who was kind enough to send me one or two photographs. This was a clock Barry found some years ago in neglected condition. It now belongs to Giles Stevenson, for whom Barry is about to start work on it and who kindly allowed me to illustrate it here. The clock originally had a verge pendulum but was converted later to anchor escapement and long pendulum. The hammer is positioned on the right, and, for a clock of this period, that usually means, as it does in the case of these two clocks pictured here, that the clock was built to run on two separate drive weights. This clock held several surprises. Firstly its dial was virtually identical to the other two I had seen, the chapter ring identical on all three. It was an unusual chapter ring at that, as the half-hour markers on all three are the type we usually call fleur-de-lys, but very oddly the three dots of the fleur de lys were not joined together. I cannot recall seeing this on any other lantern clock, and it is perhaps just a quirk of the engraver of these particular ones. The chapter rings attach by two feet instead of the usual three or four. At my suggestion Barry removed the chapter ring, which to our great delight revealed the year of making - 1697. Removal of the chapter ring also revealed another interesting feature, which I had noticed on the other two clocks - the engraved centre of the dial sheet was partly covered by the inner chapter ring edge. In other words the chapter ring clipped short the centre engraving. It looks as if the chapter rings of all three clocks came from a separate source from the dial sheets. There was no doubt the same engraver engraved all three dials as the centre pattern of each is identical and the W on all three has those unusual, eccentric, stylistic loops, which we do occasionally see elsewhere but which are unusual enough to be noteworthy. The engraved dial centre designs of all three are identical but the corners vary. Putting the three clocks in date sequence, it looks as if the 1692 clock is the earliest with leaves in all four corners. Next comes the fusee conversion clock with the leaves in the lower corners are flower-like decoration in the upper two. We can guess its date at about 1695. Third comes the 1697 clock, where all four corners are floral. Our engraver progressed in five years from all leaves to all flowers. A detailed examination of the two clocks showed some interesting features indicative of John Warner's personal hand in the making of them. In other words they have features that are not standardised and therefore imply that he made them himself rather than just buying them in with his name on the dial.